Well, my To Do Lists are working. I have been getting more done. Less things have slipped through the cracks. I have showed up to meetings and remembering to bring everything I was supposed to. And I do love checking things off. 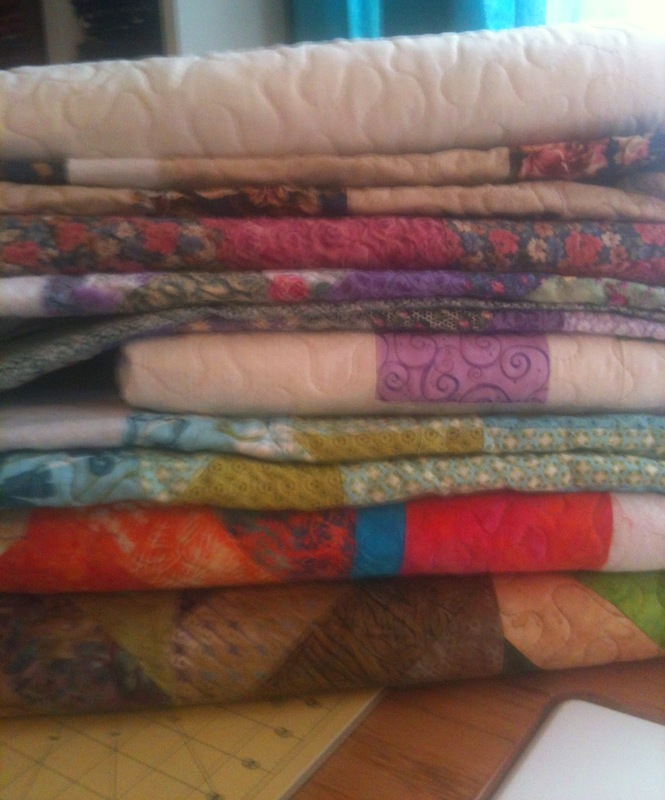 I went through all of my pile of quilts to be quilted and measured each and every one. I started an index card for each quilt. No more re-measuring the quilts to find out what size back or batting or binding or whatever. Next, I did the calculations to write down the size needed for the back and batting for each quilt. I worked up how many yards that would be. That makes it a lot easier to search the quilt stash or the quilt shop to find an appropriate piece. Next I went through all of my batting scraps and found all of the scraps that would be useful for the baby quilts or the wheelchair quilts I had waiting. I took the rest of the batting scraps to my quilt guild and put them up for grabs. They all disappeared, just like the snap of your fingers. Hurrah! These 8 were mine, the rest were Mom's or others. Then, I pulled out my roll of batting and started cutting batting the appropriate size for the quilts I had waiting. I cut an entire bolt of batting. I stacked each quilt with its back and its batting on my shelf waiting to be quilted. No bottlenecks. No excuses. And finally, I started quilting. In the last two weeks, I have quilted eighteen quilts. Yes, eighteen! Now, some of them were baby quilts or wheelchair quilts, but at least half were throws or twins. I am exhausted! But I also have such a sense of accomplishment.